GROUCH, GRUMP, AND LITTLE GLOOM 'N' DOOM THOUGHT THEY WERE MONSTERS. The three little creatures have their monster accouterments all right: Grouch has two horns, the shrouded Grump has a pitchfork tail, and little Gloom 'n' Doom has two heads. They live in a mountaintop castle constantly shrouded in dark clouds, overlooking a village of fearful inhabitants. They spend their days arguing over who is the "baddest" and specialize in terrible tantrums, constant complaints, and an excess of miserable moods. But still their monster aspirations--to scare the pants off the villagers--are not fulfilled. GROUCH GOT SOME TAPE, GRUMP FOUND SOME GOOK AND GOBS OF GOO. GLOOM 'N' DOOM GRABBED A SMELLY OLD SHOE. The three whip up a large, scary figure and swath him in mummy wrappings, and a serendipitous lightning bolt morphs their creation into a moldy green monster--a Frankenstein's monster on steroids. There's just one problem. Their creature is big... but he's not BAD! He seems preternaturally sweet and loving! His first uttered sounds are strange to the ears of Grouch, Glump, and Little Doom 'n' Gloom. "DANK YOU, DANK YOU, DANK YOU!" The three bad-guy wannabes are horrified. Their monster is everything they abhor! He pets their spiders and snakes and smiles sweetly at the local serfs. Can they teach their creation the monsterly arts before he embarrasses them in front of the villagers? Caldecott-winner (for Me . 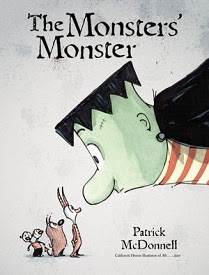 . . Jane) Patrick McConnell's new book for the scary season, The Monsters' Monster (Little, Brown, 2012) plays delightfully with Mary Shelley's Frankenstein monster trope, as these three silly little monsters find that kindness and goodwill perhaps have their own power. McDonnell's beguiling comic illustrations of small but stinky little monsters and a large but loving big one make this story a great choice for Halloween reading. Dear Glenda Childress, do you accept reading suggestions? If so, where can I send mine?